The African Penguin Festival in Simon's Town near Cape Town will take place every year in October/November. Don't miss the penguin release and see the funny birds running, or better waddling, into the Indian ocean waters at this popular South African beach! 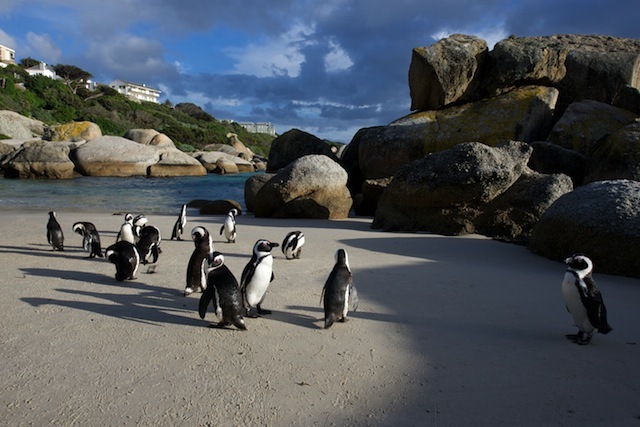 Did you know that the penguin colony at Boulders Beach in Simonstown is one of the biggest in Southern Africa. While international Penguin Day is celebrated annually in April, the South African 'Penguin Awareness Day' is celebrated in October. 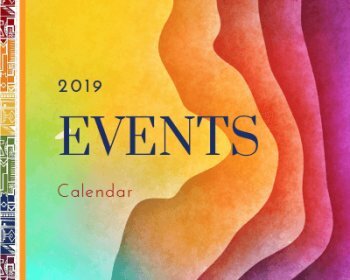 There are various events held on this day, one of the biggest in South Africa is the Festival in Simonstown where in the morning penguins are released into the wild at Seaforth Beach and then a fun festival will be held on the navy base's sports fields. The penguin release usually takes place at 10h00 and the family festival will start at 11h00. The mainland penguin colony at Boulders Beach near Simonstown is one of 27 recorded penguin colonies in Southern Africa. Boulders houses one of two mainland penguin nesting sites. The other one is near Betty's Bay (roughly 150km to the east of Cape Town) which is well worth a visit too! 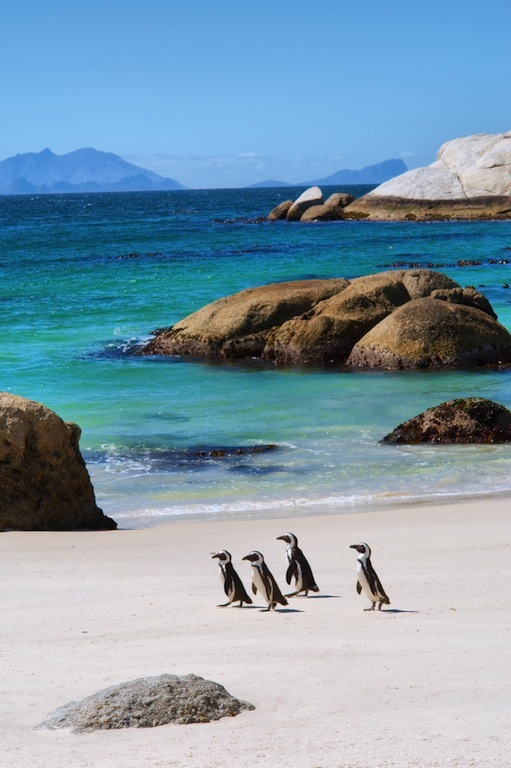 The colony at Boulders has become a major tourist attraction where people can not only watch the penguin from raised pathways, but also can get close to the little birds and swim with them in the turquoise blue, and quite warm, lagoon waters. This is something which you can find nowhere else in the world. The colony recorded their first pair of breeding penguins in 1985; from then on the colony has grown constantly and now consists of roughly 3,000 penguins. 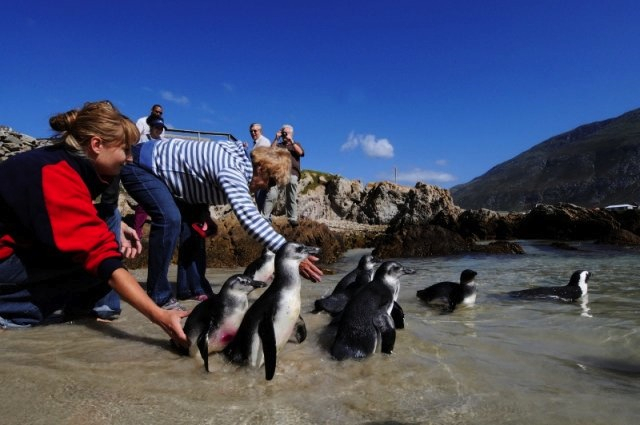 To visit the Boulders Coastal Park which is part of the greater Cape Peninsula National Parks, you will have to buy an entrance ticket either at the information centre to the Penguin Colony or a ticket at the Southern entrance to the lagoon, where there are also shower and toilet facilities. But you can also watch the little creatures from raised pathway which stretches between the information center and the beach. The African penguin was declared an endangered species in 2010 and lots of hard work by SANCCOB (Southern African Foundation for the Conservation of Coastal Birds) has helped grow the penguin population. SANCCOB is a non-profit organisation which rehabilitates injured seabirds. Every year SANCCOB releases rehabilitated penguins on Penguin Awareness Day and this is quite a spectacle. In 2012, a total of 1683 breeding pairs of African Penguins were releases according to SANCCOB . This organisation is always happy to take on volonteers and donations helping them to keep the seabirds and sweet little penguins healthy and fit. Sanccob's Cape Town center is located in Blouberg adjacent to the Rietvlei Nature Reserve. If you find an injured seabird or have any queries regarding seabirds, get in touch with them. SANCCOB also do educational tours at their Blouberg centre and are happy to show you around. They even have a adopt a penguin program, so if you want to make a different present or gift how about adopting a little penguin? More info here. More about African Penguins, anyone? Read more: Easy to read Penguin facts, with lots of insightful info. Watch a film: "City Slickers": This is a movie for the whole family, a really delightful story of two little penguins which is filmed at Boulders Beach. The film by award winning wildlife film maker Trevor de Kock tells about the adventures of Henry and Margot, two of the Boulders Colony’s penguins. 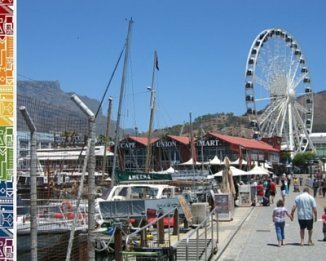 Need more info on Cape Town?